The average weight of ham is 10 lbs. to 12 lbs. An Iberico Shoulder de Bellota Fermín gives you the indescribable pleasure of going into the wonderful world of the Spanish Iberico Ham de Bellota. With a nice nutty flavor, this Iberico Shoulder de Bellota Fermín delights the most demanding palates. Furthermore, it is suitable to any diet for having many benefits to your health. Iberico Shoulder de Bellota Fermín regarded as a treasure in the world culinary culture, give you the great pleasure of discovering the wonderful world of Spanish Iberico Ham de Bellota. It is derived from the front leg of purebred Iberian black pigs and fed mainly on acorns. With a nice nutty flavor, this Iberico Shoulder de Bellota Fermín delights the most demanding palates; it is also a good chance to show your skills for cutting a good ham to your friends and family. Besides, it is suitable to any diet for having many benefits to your health, now available in the USA, a ham of such quality, as it is the Iberico Shoulder de Bellota Fermín. The Iberico Shoulder de Bellota Fermín is obtained from the front leg of the purebred Iberian black pig. This pig is also called “walking olive” for the wonderful features of its meat in which fat infiltrations occurs. Therefore, Iberico Shoulder de Bellota Fermín looks like as a piece of marble and it has a particularly delicious aroma, a little salty and a sweet nutty flavor that delight any palate. This Iberico Shoulder de Bellota Fermín is regarded as one of the best within the Spanish Iberico hams. The quality of the Iberico Shoulder de Bellota Fermín depends on the selection of purebred Iberian black pigs, the extensive breeding regime in the pasturelands where they can move freely, also feeding and healing which usually lasts up to 24 months. This Iberico Shoulder de Bellota Fermín distinguishes from the rest by its texture, aroma and unique flavor; however, it varies depending on the quality of acorns. Iberico Shoulder de Bellota Fermín is different to Pure Iberico Shoulder de Bellota 5J because porks not only consume acorns but also feed on cereals, wild herbs and grasses. 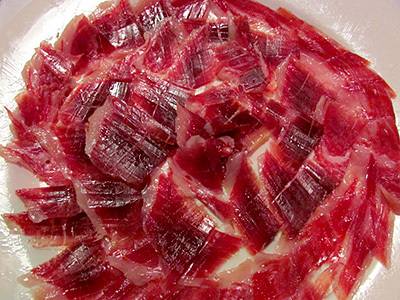 Furthermore, it is characterized by having a less pronounced flavor than the pure Iberico Shoulder de Bellota. Although these two products rival each other in quality, Iberico Shoulder de Bellota Fermín has a rich and delicate flavor very appetizing that certainly you will never forget. Ingredients: Pork meat, salt, seasonings (sugar, sodium citrate, potassium nitrate, sodium nitrate). Gluten-free. Manufacturer: Embutidos y Jamones Fermín. Enjoying an Iberico Shoulder de Bellota Fermín freshly cut is a delight; this is the way that all its flavors, aromas and textures are at their best thus cutting from the previous day might damage the exquisite taste of this delicate dish. 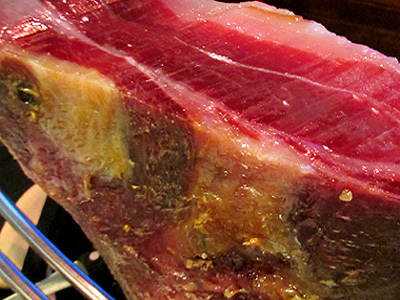 Contact with air, might cause the slices of the Iberico Shoulder de Bellota Fermín begin losing part of its perfumes. As soon as you receive your Iberico Shoulder de Bellota Fermín, remove the cover or wrapper. The Iberico Shoulder de Bellota Fermín must be stored in a cool dry place (approximately 15 ºC), and safe from insects. You can suspend or install it on a support. For appreciating better taste, it is advisable to consume at room temperature (19 ºC to 22 ºC). mold might appear but there is nothing to be worry about, just clean this area with paper towels soaked with olive oil and continues cutting your Iberico Shoulder de Bellota Fermín. First, place the ham holder on a firm surface such as a table, at a comfortable height. The way you must put the Iberico Shoulder de Bellota Fermín on the holder will depend on the time provided for its consumption: if you are going to consume the iberico shoulder at once (or within a short period), place it with the hoof upwards. On the contrary, if you plan to consume it within a long period, you must put it with the hoof down, thus start cutting by the narrowest part of the shoulder, which is more healed and has less fat in order to avoid further drying. It is very common to find inside the Iberico Shoulder de Bellota Fermín some tiny white dots sprinkled between the lean meats, which are not harmful at all. These are crystals of thyroxin produced by a degradation of proteins, which is a sign of quality and correct aging of the Iberico Shoulder de Bellota Fermín. To remove slices from the Iberico Shoulder de Bellota Fermín start cutting from the narrowest part to the widest part of the piece. It is very important to use a sharp knife. The first few slices of the Iberico Shoulder de Bellota Fermín shall be of fat, but the rest meat. Therefore, try hard to get very thin slices of about 4 or 5 centimeters long, by sliding the curving knife gently by the shoulder in small movements, back and forth and always keeping your hand behind the knife in order to collect slices and avoid accidents. The surface of Iberico Shoulder de Bellota Fermín should always be as uniform as possible, so if after a few cuts the surface is curved, start cutting some thicker slices to make it as level as possible. This way you will use much better the Iberico Shoulder de Bellota Fermín. Why buying an Iberico Shoulder de Bellota Fermín? and has many beneficial properties to health and nutrition of people; it is also suitable to maintain any type of diet for being low in calories. According to studies in the USA, the Iberico Shoulder de Bellota Fermín ham has zinc, a mineral that acts in the body by increasing the immune system and reducing the arteriosclerosis, it also acts positively on mental activities, increasing sharpness in taste and smell senses and helps to heal stomach ulcers. thus Iberico Shoulder de Bellota Fermín fat is the healthiest of all the animal fats, even competing with vegetable oils but only olive oil is better. 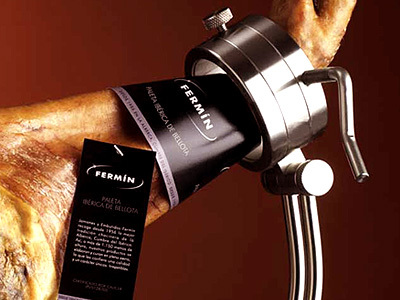 The elaboration process of an Iberico Shoulder de Bellota Fermín is the same like the others products of Fermín Brand. It is slow and laborious; it can last up to 18 months and 2 years and it is made in five stages: raw material receiving, salting and rinsing, settling, drying and curing, aging or warehouse. During the elaboration process the ‘Maestro Jamonero” plays an important role, controlling the duration of the different stages of each piece, following the ancient tradition and giving the necessary care to each piece for reaching this unique delicacy, qualified as one of the best in the world. This Iberico Shoulder de Bellota Fermín already cut is a good choice for being economical for small families. Iberico Shoulder de Bellota Fermín ham is rich in mono unsaturated acids and oil oleic acid which reduce bad cholesterol and help to regulate good cholesterol by helping to overcome cardiovascular events, thus the systematic consumption of this type of food provides the body vitamins and minerals, which makes of this product a healthy food. There are regulations for this type of products, such as: the Regulation 2419/1999 and Order in Council 1083/2001 that deal with Iberian pigs breeding, purity of breed and manufacturing of products obtained from this animal, moreover guaranteeing quality and putting on the market Iberico products. The main objective of the Order in Council 1083/2001 is to protect the industry, as well as consumers and to prevent fraud and distortions of competition with any other Iberico product. 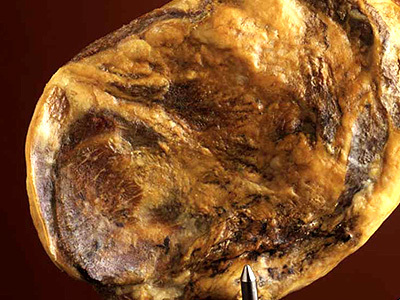 Iberico Shoulder de Bellota Fermín is recognized as a traditional specialty guaranteed in the Spanish food industry. This special and traditional Spanish dish is regarded as a product of the highest quality food. The Company “Embutidos y Jamones Fermín” is a unique project founded in 1956, together with a long tradition of knowledge that has been transferred from generation to generation has succeeded in becoming the first farm of selection of Iberian pure black pigs where these animals feed themselves and achieve the quality of their products. 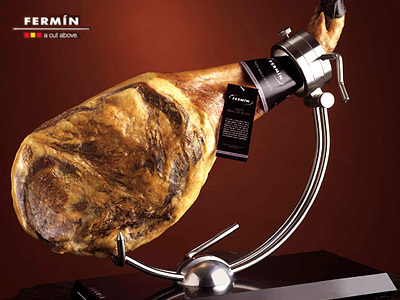 Fermín Brand, with a tradition of more than half a century exporting its products to many countries succeed the quality of its production and a style of work which has provided numerous recognitions, as well as the award for "Best Spanish Food Company " in 2006.